Hollywood's army of marketing gurus successfully muscled 3D projectors and their inflated ticket prices into every mall theater in America well over two years ago, and the robotic publicist rhetoric of "progress" and "immersion" still kindles fresh bursts of frustrated backlash every time a new 3D film has to make the rounds at press junkets. But it's just the latest symptom of a kind of moviemaking Hollywood has embraced since the late 1970s. The notion that movies are theme park rides — as opposed to interactive experiences — was more or less fathered by Steven Spielberg and George Lucas, the first generation of post-Disneyland filmmakers. Conceived with Jaws, birthed with Star Wars, and fully grown by the release of Raiders of the Lost Ark, this narrative method, now widely copied, essentially locks the audience into emotional trajectories as fixed and unresponsive to audience influence as the rails of a roller coaster. Chintzy goggles adapted from the pseudo-cinematic 3D shows theme parks used to have are just accessories. 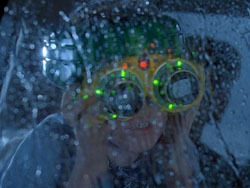 The rerelease of Jurassic Park for its twentieth anniversary, in 3D instead of its original 35mm, is an odd chance to reflect on the struggles and failures of the mighty Spielberg. Jurassic Park is still his biggest box office hit, the highest-grossing film of all time when it was originally released in 1993 — surpassing, significantly, Spielberg's own E.T. : The Extra-Terrestrial, which, in turn, had surpassed Spielberg's Jaws. Now the highest-grossing films of all time are James Cameron's Avatar and Titanic, both of which springboarded off Jurassic Park's CGI revolution and the former of which extended it into the current 3D craze (Titanic was also converted to 3D and rereleased last year to huge box-office success). The gulf between them and Spielberg's dinosaur romp on lists of highest-grossing films is mostly composed of 3D films of the past four years. Despite Spielberg's cheerful reassurances in numerous interviews that he had always envisioned Jurassic Park in 3D anyway, it smacks of desperation and moneygrubbing. It's a shame that Spielberg's more innocent side gave in to his shrewd business acumen and allowed this needless kowtowing to market trends. I saw Jurassic Park last summer in its original 35mm format with DTS surround sound, and, even with the moments of black leader covering up where the twenty-year-old print had broken and the frequent pops and crackles, the dim RealD 3D version I caught at my local multiplex paled in comparison.1 Perhaps Richard Corliss's outlandish comment in Time magazine that Jurassic Park's 3D effects are comparable to Gregg Toland's brilliant deep-focus cinematography in The Grapes of Wrath and Citizen Kane makes a bit more sense if you have seen it in 3D IMAX instead of the paltry mall-quality digital projection Americans are slowly being weaned onto, but it's simply distracting and feels like an embarrassing afterthought when lens flares and out-of-focus foreground objects hover in your peripheral vision. The once ground-breaking computer-generated effects are still more dazzling than the 3D effects, and they do far more to bring the world of dinosaurs to life. As cold and insincere as it may be for Spielberg to flush an "updated" version back into theaters as a marketing blitz for the forthcoming 3D sequel, Jurassic Park still exemplifies, for better and worse, the staying power and effectiveness of Spielbergian theme park ride filmmaking, independent of the fact that it is actually about a theme park, and its success is a testament to how skilled he can be at showing an audience what it wants to see. The film's slim science fiction premise and slasher-film structure are almost as ubiquitous as Star Wars, Indiana Jones, Jaws, and other brands of Spielberg and Lucas myth-marketing. An eccentric billionaire (Richard Attenborough) clones dinosaurs on a tropical island to use as a theme park attraction, but when a dinosaur kills a worker, his investors force him to bring in some scientists to assess the park's stability, including a gruff but lovable paleontologist (Sam Neill), a smart-aleck hipster mathematician (Jeff Goldblum), and a female paleobotanist who is given just enough fumes of feistiness to make it through the film more or less unscathed (Laura Dern). Also present are a spineless lawyer (Martin Ferrero); a fat computer nerd (Wayne Knight); a nondescript office manager (Samuel L. Jackson); and a stern game warden (Bob Peck), all of whom are uninteresting stock characters who provide easy snacks for the hungry dinosaurs; and the billionaire's grandchildren (Joseph Mazzello and Adriana Richards) hang around to provide child-in-peril character motivation for the adults whenever the plot starts to sag. Obviously, everything goes haywire, all the greedy or uncool characters get gobbled up, and everyone else escapes just in the nick of time. Spielberg's hallmark themes of family nucleation and inner-child wonder are as transparent and calculated here as they are in the dreadful Hook that preceded it, but the brisk and rigid pacing keeps this out of sight and out of mind while the reels are spinning. Indeed, it's difficult to think about much of anything while the film is going, including the specifics of the science fiction elements, the characters' poor decisions, and the continuity errors that pepper the film's second half. The rerelease has been receiving obligatory accolades for how well its CGI holds up, but its greatest strength as a theatrical thrill ride is also its biggest flaw as a work of imaginative entertainment, and that's the cold, mathematical precision with which the audience's emotions are manipulated. It's not simply the family-oriented heartstring-tugging of Dr. Grant, the paleontologist who doesn't like kids, learning how to be a surrogate father figure. Each scene and each moment has the same dramatic trajectory, often building up tension with Pavlovian music cues, easing down as a character is killed or nearly killed, and concluding with a light joke to let the audience know that, for now, everything is all right. The constant close-ups, bullying John Williams score, and brisk pace lock you into the film's prescribed emotional path with hardly any breathing room to allow imagination to take root. Depending on your disposition and how many times you've seen the film already, this can either be a kinetic joy or a bizarre disconnect. Distracted by the 3D and having seen the film dozens of times since childhood, what mainly struck me here was Spielberg's occasional mean-spiritedness. 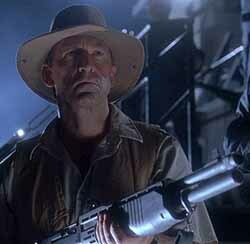 The fact that it took me many viewings to really be disturbed by it is probably largely the result of my own emotional commitment to the film through countless hours spent reenacting it with toys and other children, but it's at least partly due to Spielberg's own careful concealment of his inner misanthropy. Wayne Knight's villainous nerd character, Dennis Nedry, seems to be motivated primarily by a desire to be paid for his services and shows no malice toward his fellow human beings beyond a general lack of sense, yet he is mercilessly characterized as a despicable slob and is dispatched with relish. The same is true of the lawyer, who was given all the unsavory characteristics that Attenborough's character had in the original novel so that we won't feel so bad when he's munched down by a T. rex. 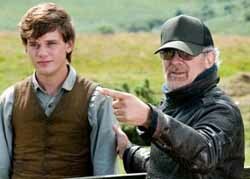 Most telling, though, is a smartass kid at the beginning of the film who is ridiculed by Dr. Grant. The kid not only serves as a sort of child parallel to Nedry (in the same way the billionaire's grandchildren serve as parallels for Grant and the paleobotanist) and is, therefore, fair game for mockery, but his joke about the relationship between dinosaurs and birds being dumb and unfrightening turns him into an on-screen representation of dinosaur illiterate yokels, hypothetically jeering at the film's paleontological details. A lot of what Middle Americans know — or think they know — about dinosaurs comes from the popularity of Jurassic Park in the first place, and this wasn't common knowledge in 1993. Slipping in a jab at the ignorant like this is something of a precursor to Spielberg's horrifying representation of the American masses as reality TV lynch mobs in his otherwise masterful A.I. : Artificial Intelligence. Now twenty years old, Jurassic Park stands at almost the exact midpoint of Spielberg's career as a director of feature films, released nineteen years after his debut, The Sugarland Express. Capping his heyday as Hollywood's blockbuster golden boy, it not only shows its debt to earlier Spielberg works but also predicts his own lack of growth and endless recycling in the subsequent years. That Jurassic Park is partly a reworking of Jaws is obvious and excusable, considering that they're both monster movies by the same auteur, and likewise for its debt to Westworld, the science fiction horror film written and directed by Jurassic Park author Michael Crichton. 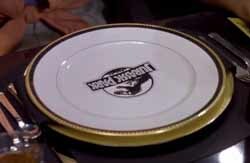 But Jurassic Park's dirty little secret is how much of it is taken from John Ford films. Spielberg isn't shy about his ostentatious homages to Ford in his designated "serious" films like Lincoln, War Horse, and Saving Private Ryan, all of which not only copy Ford's style, values, and subject matter, but receive prestigious awards for doing so. However, Spielberg's designated "fun" movies are rarely so upfront about their heritage, and though they don't rake in the Oscars as a dubious flagsucker like Saving Private Ryan does, they are his cash cow. More Freudian critics like to ascribe the omnipresent daddy issues in Spielberg's work to his relationship with his own father, but I suspect it has as much to do with his ongoing agon with John Ford, which manifests not only as an inability to outgrow his influence, but a refusal to acknowledge it in his lighter, more childish, more Spielbergian works. The links to Ford in Jurassic Park are subtle and pervasive, even ignoring its numerous superficial similarities to Ford's lusty jungle adventure Mogambo. Ford's penchant for combining low comedy with dark tragedy and scenes of violence is implemented as just another tool for plucking the right emotional chords, with nearly every thrilling scene concluding with an offhand joke in the same vein of inoffensive folk wit as the foolish drunk swilling whiskey during the climactic battle of Drums Along the Mohawk. The plot has more or less the same beats as Stagecoach, with the stagecoach replaced by motorized theme park cars, the Apaches replaced by theropod dinosaurs, and, in a typical apologist flourish on Spielberg's part, the role of inside man villain transferred from the megalomaniacal capitalist to the fat misfit. There's even a rough parallel between Ringo's final confrontation with the Plummers and Dr. Grant's museum showdown against two velociraptors. Indeed, aside from the children, nearly the entire cast could have been easily replaced with members of the John Ford Stock Company. Dern, Neill, and Goldblum play the parts for fit for Vera Miles, Thomas Mitchell doing his everyman routine, and John Carradine at his coolest, respectively. Knight's Dennis Nedry is a dark twist on Andy Devine's comic persona, and the same goes for Ferrero's lawyer and Donald Meek's comic coward. Attenborough's John Hammond fits the Ford archetype of the ambiguous and magnificent patriarch, especially Charles Winninger's portrayal of Judge Priest in The Sun Shines Bright. Most spectacularly, Bob Peck's game warden is a near perfect John Wayne role, if the duke would stoop to play a thankless bit part; even through Peck's accent, you can practically hear Wayne drawling out tough guy lines like "They're lethal at eight months, and I do mean lethal." None of this makes Jurassic Park any less of a good time for those just looking for a decent monster movie, and its indebtedness to Ford, while telling of Spielberg's anxieties and inadequacies, at least keeps it free from the machine-gun editing and screenplay bloat that plagues so many recent zillion-dollar adventure films. However, it's rather faint praise to say that a film that was a solid monster movie twenty years ago is still one today, and as much as Spielberg clearly loves the original King Kong, he doesn't seem too concerned about helping get that masterpiece back in theaters for a new generation. Maybe he truly is as innocent as he acts and honestly believes that King Kong is still more popular with average young moviegoers than Jurassic Park, and maybe he does have non-financial reasons for rereleasing Jurassic Park for its twentieth anniversary and not his more personal and misanthropic 1941 for its thirtieth. His continued reign is more dependent on a widespread ignorance of, rather than familiarity with, the sorts of John Ford and King Kong referents that make up the bricks and mortar of his most successful works, and rereleases like this help perpetuate the Hollywood ouroboros of self-recycling remakes, reimaginings, sequels, prequels, and postmodern popcorn extravaganzas that offer nothing more than the movies themselves, and, even then, only the ones we've already consumed.